This year our family is participating in a CSA , community supported agriculture. We are a part of the Delvin Farms co-op, which provides a bushel of organically grown food each week. It is so fun to guess what might be in our bushel, although mom has a heads up because the owner sends an email of what to expect with some recipes. The last few weeks I haven't gotten around to take a picture before I jumped into the goodies. 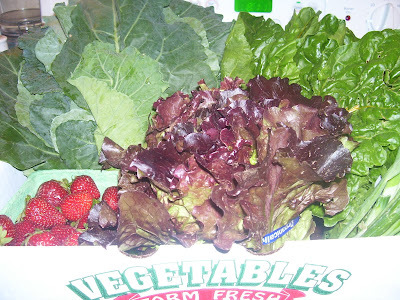 So far, we have eaten kale, swiss chard, onions, garlic, lettuce, strawberries, and this week collard greens. This new experience has really challenged my cooking skills, which are lacking, so I have had fun learning and trying new recipes. If you have any good ones to share, please do... There is a recipe we tried this week and really enjoyed! Boil pasta. While pasta is cooking, in a medium pot on medium heat. cook tomato juice and kale for ~ 6-8 minutes or until tender. Stir in peanut butter and chili sauce until smooth and simmer an additional 2 minutes. Drain and return noodles to the pot. Add the sauce to the noodles and toss together well. Yummy! At first, the boys turned their nose up, but after I asked them to have a try bite, they literally devowered it! It's light, fresh and oh so good! sounds good...we will try this one for sure! If you guys liked this one, I've got one for you that the boys will be sure to love...I even make it for lunches for us sometimes. Remind me to give it to you! sorry about the removed comment...don't know what happenend, but it published my comment twice. I knew ketchup made everything taste better. I did not know that peanut butter could have the same effect! a Carolina girl by heart, a broken but beautiful vessel in the eyes of her Father, a devoted wife learning to serve her beloved in new ways, a momma to four children; three with us and one waiting in Heaven, and a grateful girl that enjoys everything from writing in a quiet nook to the swirling buzz of life in my home. C.S. Lewis and J.R.R. Tolkien: Occultic or Not?